In order to identify genes that might confer and maintain freeze resistance of winter wheat, a comparative transcriptome analysis was performed between control and 4 wk cold-acclimated crown tissue of two winter wheat lines that differ in field freeze survival. The lines, generated by azide mutagenesis of the winter wheat cultivar 'Winoka' were designated FR (75% survival) and FS (30% survival). Using two winter lines for this comparative analysis removed the influence of differential expression of the vernalization genes and allowed our study to focus on Cbf genes located within the Fr-A2 allele independent of the effect of the closely mapped Vrn allele. Vernalization genes, (Vrn-A1, B1 and D1), and the transcription factor gene, TaVrt-2, were up-regulated to the same extent in FR and FS lines with cold acclimation thus confirming that azide mutagenesis had not modified the winter habitat of the lines. One category of Cbf genes, (Cbf-2, -A22 and B-22) reflected an increase in level of expression with cold acclimation in both FR and FS lines. Another category of Cbf genes (Cbf-3, -5, -6, -12, -14 and -19) were differentially expressed between cold-acclimated FR and FS lines relative to the non-acclimated controls. Comparison of expression patterns of the two categories of Cbf genes with the expression patterns of a set of ABA-dependent and -independent Cor/Lea genes revealed similar patterns of expression for this sample of Cor/Lea genes with that for Cbf-2 and -22. This pattern of expression was also exhibited by the Vrn genes. Some Cor/Lea genes may be co-regulated by the Vrn genes during cold acclimation and the Vrn genes may also control the expression of Cbf-2, -A22 and -B22. The increased freeze survival by the FR line and the increase in expression levels of wheat Cbf genes, Cbf-3, -5, -6, -12, -14 and -19 with cold acclimation in the FR line suggests a possible gain of function mutation resulting in higher levels of expression of these Cbf genes and increased freeze survival. In order for winter cereals to switch from vegetative to reproductive phase, they must undergo a low temperature regime described as veranlization. Recessive alleles at the major Vrn loci (vrn-A1, vrn-B1, vrnB4, vrn D1, vrn D5) results in winter wheat and a dominant allele at one or more of these loci results in spring wheat [1–4]. The low non-freezing temperatures needed for vernalization are also needed for cold acclimation which is defined as the period of exposure to low non-freezing temperatures necessary for freeze survival. Cold acclimation for wheat is usually 2–4°C for 4–6 wk (autumn) conditions. The ability to survive freezing temperatures has been represented by various terms including frost tolerance, winter hardiness, frost hardiness, freezing tolerance, freeze survival, cold resistance and freeze resistance. For consistency, we use the term freeze resistance as was done in our report on water loss by hard red winter wheat during cold acclimation . The Fr loci which have been linked to freeze resistance have been mapped to all 3 genomes on the long arm of chromosome 5 in close approximation to the Vrn loci [6–8]. Therefore, attempts to identify genes linked to freeze resistance by comparing gene expression between winter and spring types have been confounded by the involvement of the Vrn loci which is also low-temperature regulated. In an attempt to reduce the Vrn loci contribution to the study of freeze resistance in winter wheat, various near isogenic lines (NILs) for the Vrn-1 genes have been generated. These include: two Vrn-1 NILs developed from the sping cv. 'Triple Dirk' [9, 10] and another set developed from the spring cv. Manitou (Vrn-A1) and the winter cv. Norstar (vrn-A1)[11, 12]. In this study, in order to normalize for the involvement of the Vrn loci, we made use of two winter wheat mutant lines that vary in freezing survival . We refer to the lines as freeze resistant (FR) or freeze susceptible (FS) based on their ability as a result of cold acclimation to withstand freezing temperatures in the fields (Table 1). The percentage survival reported represents the average of two replications. The mean height for these lines were obtained from three replications at two locations in SD. A significant body of research exists that describes the involvement of Cor/Lea genes during cold acclimation in cereals. A few of these include cold acclimation of barley and wheat [14–16]. We have contributed to these studies by examining the effect of cold acclimation on ABA-regulated barley genes such as Hva1  and wheat genes not regulated by ABA such as Tacr7 . Wheat ESTs are available for functional genomics  and include wheat Cor/Lea genes known to be controlled by an ABA-independent pathway: Wcor15, Wcor14, Wcs19, Wlt10, and Wcs120 [19, 15, 20] and others that respond to cold acclimation through an ABA-dependent pathway: Wrab17, Wrab18, Wrab19 and Wcor825 [21–24]. An understanding of the role of the Cor/Lea genes can be better achieved if the length of cold acclimation and the tissue used for cold acclimation is defined more carefully. Ganeshan et al  have demonstrated that Wcor14 levels in leaf tissue of winter Norstar declined by 21 d of cold acclimation, whereas Wcor14 levels were sustained to 63 d cold acclimation of crown tissue. Knox et al  reported no differential expression with 12°C treatment of crown tissue from wheat lines varying in freeze resistance. In our study, we were particularly interested in understanding sustained 4°C cold acclimation for at least 4 wk (the conditions we have determined distinguish FR from FS lines based on freeze survival) and specifically we wished to understand the gene expression levels in the crown tissue, the most freeze resistant part of the plant [26, 27]. With the identification of many Cor/Lea genes, researchers concluded that a better understanding of the role of such genes in freeze resistance could be ascertained by determining how these genes are regulated at the transcriptional level. Such studies led to the discovery of C-repeat/dehydration-responsive elements (CRT/DRE) in the promoter region of the Cor/Lea genes[28, 29] and the identification of the proteins that bind the CRT/DRE as CRT-binding factor/DRE-binding proteins 1 (CBF/DREB1) [30, 31]. The involvement of CBFs in the cold acclimation process has been described [32–35]. Vagujfalvi et al., [36, 37] using Cbf gene specific primers examined the response of Cbf genes in T. aestivum. They reported that a 2 hr, 2°C (LT) treatment caused a four-fold induction of genes TaCbf-14, -15 and -16 in frost tolerant lines harboring the frost tolerant allele CNN Fr-A2, compared to the frost sensitive lines. Stockinger et al  studying Cbf gene expression in barley reported that HvCbf-2 and -4 were expressed to higher levels in frost tolerant lines harboring the 'Nure' Fr-H2 allele than in the frost sensitive 'Tremois' Fr-H2 allele. The wheat species T. aestivum and T. monococcum have been reported to contain around ten Cbf groups of which groups CbfIIId, IVa, IVb, IVc and IVd were induced to higher levels in the winter cultivar in response to LT . These researchers postulated that the higher inherited and LT inducible Cbf expression may mean that these Cbf groups are major components for control of wheat to develop freezing resistance. Miller et al  generated seven recombination events within the Cbf cluster located in the Fr-A2 allele by crossing T. monococcum genotypes DV92 (spring frost sensitive) with G3116 (winter frost tolerant). These recombination events were studied by Knox et al  who described three gene clusters at the Fr-A2 locus of T. monococcum. These were designated: (1) Proximal (Cbf-2, -4, -9 and -17); (2) Central (Cbf-14, -15, -12) and (3) Distal (Cbf-16, -13, -3 and -10). From the frost tolerance data generated by Knox et al.,, the locus for frost tolerance was completely linked to the central gene cluster (Cbf-14, -15, -12). We used the Affymetrix Wheat chip for comparative transcriptome analyses between an FR and an FS line with RNA from non-acclimated and long-term cold acclimated (4 wk) winter wheat crown tissue. In this report we highlight the behavior of the Cbf genes of the Fr-A2 loci and propose a model for their involvement in confering freeze resistance. Transcript levels were averaged for two technical replicates each consisting of three pooled biological replicates. FR represents the freeze resistant line (75% field survival) and FS represents the freeze susceptible line (30% field survival). Heat maps are presented in the respective section. The colors red and green are used to indicate up-regulation and down-regulation respectively in response to cold acclimation relative to non-acclimated control samples. The black color represents no change in gene expression in response to cold acclimation. The microarray data has been deposited at the Plant Expression database http://www.plexdb.org/ accession number TA22. The data has also been deposited in the GEO database, Accession # = GSE14697 http://www.ncbi.nlm.nih.gov/geo/query/acc.cgi?token=dlqnpqqecacwgba&acc=GSE14697. 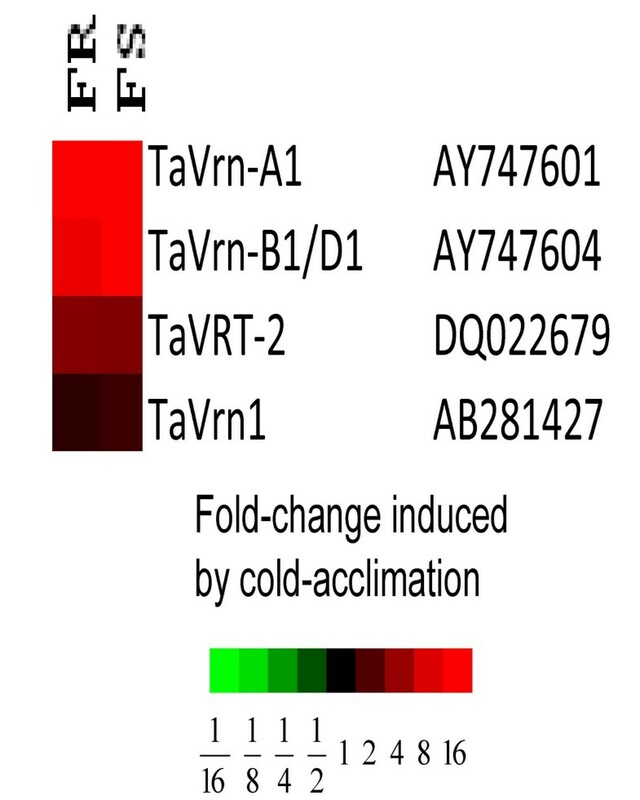 A distinction between winter and spring habitat can be made based on the expression of various Vrn genes, (Vrn-A1, -B1, -D1), and the genes for the vernalization transcription factors TaVrn1/TaVrt-1 and TaVrt-2 in response to cold acclimation. The transcriptome analyses data for these five genes are depicted in Figure 1. Genes, (Vrn-A1, -B1, and -D1), showed greater than 8-fold regulation to the same extent in FR as FS with cold acclimation relative to the control non-acclimated samples. TaVrt-2 was expressed to 4-fold levels in both FR and FS. TaVrn1 was not induced with cold acclimation in either FR or FS lines. Expression of Vernalization genes in two mutant winter wheat lines. Values are represented as a heatmap of fold change induced by cold acclimation in FR (freeze resistant, 75% field survival) compared with FS (freeze susceptible, 30% field survival) lines relative to control non-acclimated samples. Colours used to represent fold-change in gene expression are: red – up-regulated and black – not regulated. The accession numbers are listed next to the gene names. As seen in Figure 2, transcript levels for 17 Cbfs identified on the chip appeared to fall into three basic categories. Category I: Those with very low levels of expression in the crown tissue of both FR and FS lines with and without cold-acclimation (Cbf-D22, -4, -15.2, -21.1, -5.3, -10 and -9). Category II: Cbfs that are up-regulated with cold acclimation in both FR and FS lines (Cbf-A22, – B22, and -2). Category III: Cbf genes that are upregulated in cold-acclimated FR crown tissue but not in cold-acclimated FS crown tissue (Cbf-14, -6, -3, -5, -19 and -12). All expression levels are presented as relative to the control non-acclimated samples. Expression of Cbf genes in two mutant winter wheat lines. Values are represented as a heatmap of fold change induced by cold acclimation relative to control or non-acclimation in FR (freeze resistant, 75% field survival) compared with FS (freeze susceptible, 30% field survival) lines. Colours used to represent fold-change in gene expression are: red – up regulated, green – down regulated and black – not regulated. The accession numbers are listed next to the gene names. 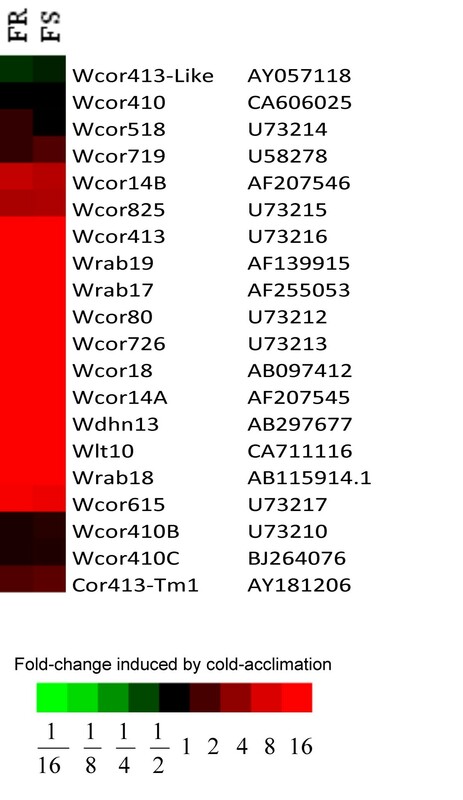 Transcription levels of 20 Cor/Lea genes including ABA-dependent (Wrab-17, -18, -19 and Wcor825) and ABA-independent (Wcor-14A,-14B, and Wlt10) Cor genes are depicted in Figure 3. Relative to the non-acclimated control samples, these Cor/Lea genes were up-regulated in FR and FS cold-acclimated crown tissue and there was also no significant difference between the pattern of expression of the ABA -dependent and -independent genes sampled. Expression of Cor/Lea genes in two mutant winter wheat lines. A heatmap is used to represent the fold change induced by cold acclimation in FR (freeze resistant, 75% field survival) compared with FS (freeze susceptible, 30% field survival) lines of a sample of Cor/Lea genes. Colours used to represent fold-change in gene expression are: red – up regulated, green – down regulated and black – not regulated. The accession numbers are listed next to the gene names. The pattern of gene expression from the microarray was verified by examining the relative transcript levels for candidate Cbf genes normalized to the 18S ribosomal transcript levels by real time qRT-PCR. Since our criterion for relatedness to freeze resistance is based on differential expression between FR and FS lines, we present RT-PCR data on members of the Cbfs that were differentially regulated. As seen in Figure 2., the high level expressing Cbf genes of this group are Cbf-6, -3, -5, and -12. Since Cbf-6 and -3 are very similar but different from Cbf-5 and -12, wechose to examine by RT-PCR Cbf-3, -5 and -12. The results are depicted in Figure 4. 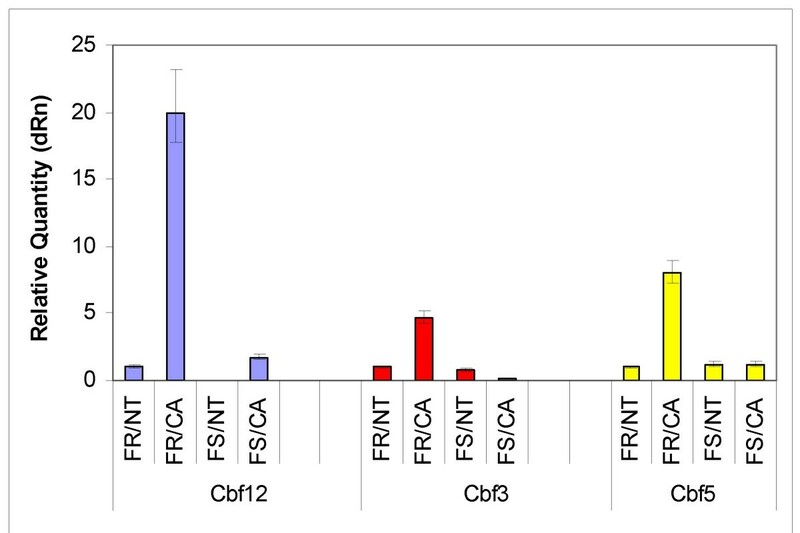 As viewed by relative quantity (Figure 4) all three genes were not significantly expressed in control or non-acclimated FR and FS tissue. However all three were upregulated in response to 4 wk cold acclimation of FR crown tissue but not significantly changed from baseline expression in 4 wk cold-acclimated FS crown tissue. The pattern of expression was similar to that observed from the microarray. Confirmation of microarray expression pattern by RT-PCR. Total RNA isolated from crown tissue of FR and FS winter wheat lines and primers (Table 2) were used to determine Cbf-3, -5 and -12 expression levels. Values were calculated with the MXPro-Mx300P Stratagene software with the 18S levels as normalizers and the FR/NT levels as the calibrator. The relative quantity of gene expression for NT = untreated or non-treated samples, CA = cold-acclimated samples of FR and FS lines are depicted. We believe that studies to unravel the basis of freeze resistance in winter wheat are confounded by the use of comparisons between winter and spring cultivars. Therefore, we designed our experiments to normalize for the contribution from the Vrn loci by using two winter types derived from the same starting winter cultivar. Our comparison of Vrn gene expression between FR and FS with cold acclimation (Figure 1) leads us to conclude that the mutagenesis procedure used to generate these lines did not affect the molecular basis of the winter habitat. Having verified that the Vrn genes were being expressed to the same levels in FR and FS lines in response to cold acclimation, we could now examine the expression of the Cbf gene clusters described by Badawi et al  and Knox et al . In particular we queried the Cbf genes that were available on the Affymetrix wheat chip that had been mapped to the long arm of T. aestivum chromosome 5. According to Badawi et al  the Cbf genes at the Fr loci included Cbf-2, -3, -4, -6, -9, -10, -12, -14, -15, -19, -20, -21 and -22. However, according to Knox et al.,  the Cbfs at the Fr loci are Cbf-2,-3, -4, -9,-10, -12,-14 and -15. These researchers identified Cbf-6, -19, -20, -21 and -22 as not belonging to the frost tolerance gene clusters. Our data leads us to agree partially with Knox et al., . Genes not differentially expressed between FR and FS lines in our system are assumed to be not associated with freeze resistance. Thus like Knox et al.,  we place Cbf-21 and -22 as unassociated with winter wheat freeze resistance. However we disagree with the findings of Knox et al.,  relative to Cbf-6 and -19. In our system, the Cbf genes differentially regulated between FR and FS lines included Cbf-6 and -19. These were described by Knox et al.,  as belonging to the unlinked cluster. We also observed differential expression for genes from the central (Cbf12, 14) and distal (Cbf3) clusters on the long arm of chromosome 5 (Figure 2). Additionally Cbf5 was identified as differentially regulated between FR and FS (Figure 2 &4). However, it is not located on the long arm of chromosome 5. Thus, the relationship of Cbf5 to the other Cbf genes that map to the Fr loci will be of interest in determining the role of Cbfs in other plant responses other than freeze survival or the identification of other loci that associate with the Fr loci to confer freeze resistance. From expression data, it is possible to cluster genes that are co-expressed in response to a stimulus. Co-expression usually suggests coordinated gene transcription and allows for the identification of transcription factors and the genes that they regulate. Comparisons of co-expression have been performed to identify transcription factors  and biosynthetic enzymes . These findings led us to attempt to identify which of the Cor/Lea genes are controlled by which Cbfs by comparing the expression patterns of the Cbfs with the Cor/Lea expression patterns. If a similar pattern of expression is an indicator of coordinated gene transcription then we can deduce from our results that the sample of Cor/Lea genes examined that belong to both the ABA-dependent and ABA-independent pathways are coordinately regulated (Figure 3). And since the pattern of expression of these Cor/Lea genes is similar to that of Cbf-2 and -22 then we can assume that Cbf-2 and -22 encode the CBFs that control the expression of this cluster of Cor/Lea genes. Another set of genes with similar expression patterns with the Cor/Lea genes were the Vrn genes (Figure 1). This co-expression pattern suggests that the Cor/Lea up-regulation may be via the Vrn genes signaling pathways. This hypothesis is supported by the findings of Danyluk et al.,  that the Vrn-A1/vrn-A1 locus regulates Cor/Lea gene induction. We propose that this sample of Cor/Lea genes are regulated by Vrn-A1,-B1 and -D1 genes during cold acclimation. It will be of value to determine the relationship between the coordinated expression of the Cbf- gene set (Cbf-2, -A22, and -B22) and the Vrn - gene set (Vrn-A1,-B1 and -D1). The differential Cbf gene expression levels observed for Cbf-3, -5, -6, -12 -14 and -19 did not correlate with gene expression patterns for any of the highly expressed Cor genes examined. Thus we can assume that at 4 wk cold acclimation these Cbf genes were not involved in regulation of this group of Cor genes. To unravel the complex inter-relationship between the Cbf genes, cold acclimation and freeze resistance we propose the following model. We propose that one of the Cbf genes belonging to the central cluster (Cbf-12 or -14) may serve as a key regulator of other genes including other Cbf genes. For simplicity we designate that key regulator as Cbf-K and we designate the target Cbf genes as Cbf-T. Possible Cbf-Ts would include Cbf-3, -5 and -6 which then control expression of down-stream target genes designated TGs. 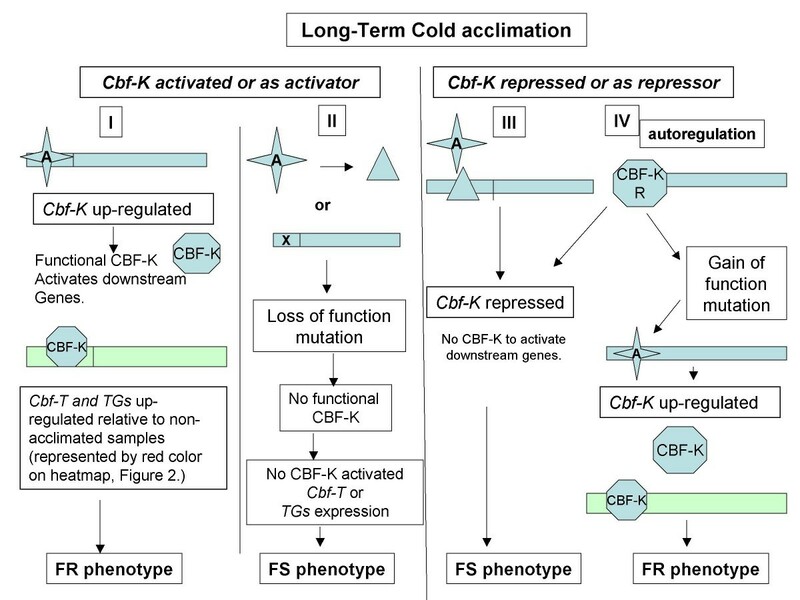 We propose that with cold acclimation, Cbf-K can be activated resulting in the production of functional CBF-K which activates downstream genes to produce the FR phenotype (Figure 5I). The FS phenotype could be generated from the FR phenotype by a "loss of function" mutation as a result of mutagenesis. This could be achieved if the Cbf-K activator binding site is mutated resulting in low-level to no increase in transcription of the Cbf-K gene (Figure 5II). Model Relating Cold-Acclimation, Cbf- genes and FR versus FS Freeze Resistance. From the central cluster, we choose Cbf-12 or -14 as a key regulator (Cbf-K) of target Cbf genes such as Cbf-3, -5 and -6 (Cbf-T) as well as down-stream target genes (TGs). (I) Activator (A) is able to upregulate Cbf-K resulting in a functional CBF-K and activation of downstream events. (II) Modification of activator (A) by mutagenesis or a mutation in the activator binding site could result in loss of downstream actions and the lower level of freeze survival of the FS line. (III) Cbf-K may be repressed by an external repressor of by repressor function of CBF-K. As a result the downstream activities are not operational and the FS line is observed. (IV) A mutation resulting in disruption of repression of Cbf-K would lead to up regulation of Cbf-T and its TGs and the increased freeze survival of the FR line. However, because wheat is hexaploid, and the FR line has a significant increase in survival compared to the WT or the FS line (Table 1. ), we believe that we are observing the effects of a "gain of function" mutation. It is possible that in FS lines, Cbf -K is repressed by an external factor or by autoregulation and as a result Cbf-T and its TGs are not activated (Figure 5III). The azide mutagenesis could have resulted in either a mutation in the repressor binding site for Cbf-K or a mutation to the repressor domain, allowing for an active CBF-K and therefore activation of the downstream genes that lead to the freeze survival properties expressed by FR lines (Figure 5IV). Future studies will allow us to determine whether Cbf-12 and/or -14 play a key role in conferring freeze resistance by any of the possible mechanisms proposed and whether Cbf-3, -5, -6 and -19 are target genes or master switches. The FR and FS lines used in this study will serve as valuable tools for analayzing freeze resistance of HRWW and genes differentially expressed between FR and FS lines. The Cbf genes 3, 5,6, 12, 14 and 19 are potential markers for freeze survival of HRWW. 'Winoka' is a release from the South Dakota Experiment station . This release was used in an azide mutagenesis project in 1983. The sodium azide mutagenesis procedure was followed . Certified Winoka seeds (1000) were imbibed in iced-water for 16 h followed by continued imbibition at 20°C for 8 hr. The seeds were then transferred to 1 mM Sodium azide in 0.1 M potassium phosphate buffer (pH 3) for 2 hr at 20°C. The 20°C azide-treatments were performed with vigorous bubbling of air. At the end of the treatment, the seeds were rinsed for 30 min in tap water and then air-dried for 3 d. In preparation for planting, the seeds were hydrated for 24 hr at 25°C before vernalization for 6 wk. After vernalization the seeds were germinated for 3 d and viable M1 seedlings (656) were obtained. From this population of M1 Winoka mutagenized plants, 20 were identified as potential mutants based on characteristics such as striated leaves, height, varied heading date or loss of plant vigor. Several of these lines were tested for freeze survival at various locations in SD and ND. Two of these lines that varied in freeze survival were chosen for further study. An average of 2 replications of M5 lines in the Northern Uniform Winter Hardiness Nursery at Casselton, North Dakota in 1988 revealed that SD16029 had 75% survival and was designated as freeze resistant (FR), SD16169 was designated freeze susceptible (FS) with 30% freeze survival (Table 1). FR and FS plants (4 plants/pot) were grown in the green house at 22–28°C with 14 h photoperiod. Soil water was maintained at 0.3 – 0.44 kg H2O kg-1 and plants transferred to 4°C cold room for cold acclimation after reaching the fourth leaf stage as described . Since crown tissue is known to be the most freeze resistant part of the plant [47, 27], this was the tissue of choice for our study. The crown was defined as the non-photosynthetic region located just above the roots. We avoided any associated leaf or root material. At the 3rd to 4th leaf stage, control/non-treated (NT) plants were harvested, the crowns excised with a clean scalpel into liquid N2 and stored at -80°C for RNA isolation. Treated or cold acclimated (CA) crown samples were derived from plants that at the 3rd to 4th leaf stage were transferred from the green house directly to a 4°C chamber for 4 wk. At the end of cold acclimation, while maintaining the temperature at 4°C, the crown tissue was removed from each plant and the tissue immediately frozen in liq N2 and stored at -80°C. Frozen crown tissue from each of three independent replicates for FR and FS ctrl/NT samples and three independent replicates for FR and FS cold-acclimated (CA) plants were used for RNA isolation. The crowns for each of the three replicates were pooled and total RNA isolated by a modification of the procedure by Chirgwin et al.,  as described by Han . Frozen powdered tissue was resuspended and homogenized (1 g/3–5 ml) in 4 M GSCN buffer (4 M GSCN, 50 mM NaOAc (pH 5.2), 10 mM EDTA (pH 8.0), 7% (v/v) 2-mercaptoethanol). SDS (10%) was added to a final concentration of 0.1%. The homogenate was centrifuged at 12,000 g for 10 min. The resulting supernatant was filtered through two layers autoclaved Mira cloth to remove any loose debris. The cleared homogenate was then loaded on a 9 ml CsCl cushion (5.7 M CsCl, 0.1 M EDTA (pH 7.5)) centrifuged at 113,000 g for 26 h at 20°C in a SW28 rotor. The supernatant was discarded and the RNA pellet resuspended in HE/SDS (10 mM Hepes (ph 7.4), 1 mM EDTA, 0.1% SDS). RNA was reprecipitated out of solution with standard NaOAc/ethanol procedure. Some samples were resuspended in HE buffer and others in 100% formamide for long-term storage. Prior to submission for use in microarry analyses, RNA stored in formamide were reprecipitated with standard NaOAc/ethanol procedure, resuspended in depc-treated H2O. All samples were treated with DNase to remove any possible contaminating genomic DNA using the protocol as described for the Qiagen RNeasy kit. Eight samples with 61,290 probe-sets from each sample were analyzed by R/Bioconductor http://www.bioconductor.org[50, 51]. Specifically, Robust Multi-Array Average with help of probe sequence information, which is known as gcRMA [52–54] was used for microarray background correction and normalization. Gene expression data for selected Cbf and Cor genes were analyzed and visualized by the Cluster and Treeview software . Aliquots of the RNA used for the microarray analyses were maintained at -80°C until needed for RT-PCR verification of microarray data. RNA was quantified and examined for quality. cDNA was synthesized with total RNA using the cDNA synthesis kit according to manufacturer's directions (Applied Biosystems). Using the probe ID target sequences from the Affymetrix website, primers were designed to allow for real-time amplification of the chosen Cbf genes. Table 2. contains a list of the primers used in the amplification. Stratagene SYBR Green PCR master mix or Applied Biosystems qRT-PCR master mixed was used for RT-PCR or PCR as needed. The Stratagene real-time equipment located in the SDSU functional genomics core was used with the MxPro-Mx3000P software to collect and analyze the data. The data collected with the SYBR Green with dissociation curve program was converted to the Comparative PCR format. FR/NT RNA was used as the calibrator and samples with the 18S primers were used as the normalizer. Dyes used included SYBR Green and Rox reference dye. The South Dakota State University Agriculture Experiment Station provided the funds used to purchase the Affymetrix wheat microarrays and cover the contract to the University of CA Riverside Genome center to perform the hybridizations and scanning of the microarrays. D.C. and X.G. were also partly supported by the Experiment Station. We thank Jim Koepke and Han Kai for assistance with preparation of the plant material during their tenure at South Dakota State University; Han Kai for the first stage preparation of the RNA used in the GeneChip experiments; Paul Rushton for helpful discussions about transcription factors and review of the manuscript; David Horvath, Anne Fennell and Eugene Butler for useful discussions regarding analysis and presentation of data. FS and DK contributed to the experimental design, plant physiology, abiotic stress treatments and molecular analyses. FS performed the real time PCR, analyzed the data and drafted the manuscript. DGC and XG contributed to the experimental design and the bioinformatic analyses. All authors read and approved the final manuscript.